Photographer is A. S. Corey of Clinton, Missouri. Written on the back is Mary Sullivan / Nov 22 – 1874 / D. Dec. 3 – 1875. Fellow blogger Scott over at DCPhotoArtist posted a comment earlier that got me thinking again about post-mortem photographs. Those would be memorial photos taken of dead people, a practice much more common a century ago or more. 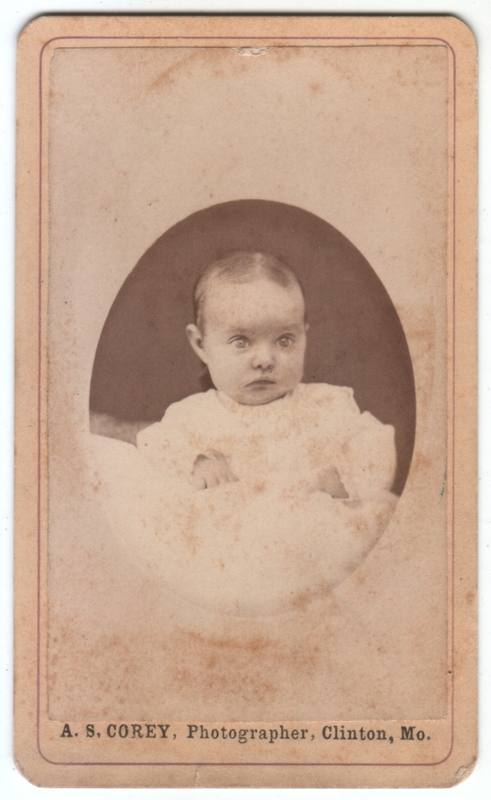 I have already posted the only two photos I have in my collection that I believe are post-mortem photos. But every once in a while I wonder about this one. Call me crazy, but something about it makes me keep questioning it. I haven’t posted it because I wasn’t sure, but I figured, what the heck, I’ll just put it out there and let other people decide for themselves. It’s an interesting photo regardless. I usually assume she is alive here because her face seems rather expressive. So how, you may reasonably ask, could this be a photo of a dead person when her eyes are open? Well, propping the eyes open was one thing that was occasionally done to make the subjects look more as they did in life, as was retouching the photo by painting eyes on the finished photo (as well as sitting the body up, tinting the cheeks, etc.). Normally, a post-mortem photo just looks like a photo of a corpse, which it is, but sometimes they are well enough done that it’s easy to be fooled at first glance. And it seems to me there’s a certain collapsed, propped-up quality to her body, which makes me suspicious. Another thing that makes me wonder is this photo, one of the first photos I posted, which I assume is a companion piece, probably a brother to our Mary here. Same photographer, same last name, similar birthdates, and same handwriting on the back. One of the pleasures of doing this blog is learning as I go, and since posting this earlier photo of Artie, I have learned that a hidden adult holding a squirming child still for a photo was a not-uncommon practice for getting a photo taken, particularly when things like head clamps were unavailable or impractical. (Fellow blogger Chelsea assembled a wonderful bunch of images of shrouded adults over on her blog.) While it’s possible that Mary’s photo has been retouched, particularly given the artistic framing, it looks like she’s not being held like the rambunctious Artie was. Was she simply a more sweet, docile child who could be counted on to hold still for the camera, or was she, you know, dead? Finally, there’s the dates. She apparently died at age one year, eleven days. I know I’m terrible at guessing ages, but this photo doesn’t seem far off the mark. I’m still inclined to think that they managed to get a photo of her while she was alive (perhaps making this the only photo of her in existence), but I’d love to hear what others think. Your two cents are worth plenty, thank you! 🙂 This reminds me of your post where you had the picture of the child with the unusually light eyes. You see one logical conclusion (the child is alive), but you keep second-guessing yourself with other possibilities. That’s the same thing I was doing here. I finally figured it was best to get a second opinion, so thanks for yours. I have to agree with Mrs. Marvel. I’d guess Mary is about 5-7 months here, and the light reflected in her eyes suggests a moisture that just isn’t present in dead subjects. The mouth, too, seems controlled by a still-active muscle. LOL, yeah, she is a little creepy, agreed, maybe that’s part of what was throwing me off. I vote for alive because of the position of the brow (eyebrows up; brow slightly–I wouldn’t say “furrowed,” but maybe “active”). I just spent some time with a baby recently, and really noticed how much she expressed herself through the forehead! I think the offside position of the mouth is one of the things that makes the picture seem a little weird, as do the very wide eyes. Re: brightness of eyes: it doesn’t look painted on to me here, but I suppose it’s a possibility that a highlight could be added in post-production? Was that ever done? Yes, there seemed to be something forced about her face, rather than naturally active, but that’s probably just me reading something into it that isn’t there. I don’t think the eyes are painted on, certainly not to my copy, which doesn’t seem to have had any touching up done. And yes, aren’t all those veiled mother photos wonderful? I agree that Mary is alive at the time of the picture, and also under a year old. Though, she may be younger than six months. Under her right ear, it looks like something or someone is propping her up. I noticed that, too. Might be something propping her up, might be some sort of odd bow or something. Probably something her head is resting on, or even maybe a hand. To clarify, what I wondered is whether just a white highlight was ever painted onto eyes (or burned out in the printing process). I have seen touched-up photos where the pupil/iris is darkened. I don’t really know. I’ve seen (and I have examples of) darkened pupils, but I haven’t seen the other. The descriptions I’ve read seem to imply that an open eye was painted over the image of a closed eye. I’ll have to look into it to see if I can find a better explanation, or some examples. When I was researching a possible mori photo I learned that open eyes were sometimes painted onto the negative so that when the print was made the eyes looked open. I do not know how common that was, but for it to have been documented a few times in articles, it suggests that it was an accepted practice at least. Yes, I’ve heard reference to it once or twice, too, but I don’t think I’ve seen an example. I’d be very curious to, if you find one. This reminds me that, in “Dr. Horrible,” [not really a spoiler ahead, but stop reading now if you don’t want to know even the slightest hint about the plot] they say on the commentary that the brightness of one character’s eyes is digitally dimmed to simulate death. Funny how vital a clue the eyes can be. Alive, not creepy, just sad that she died. A perfectly normal stunned mullet baby look, it seems to me!